eft Davy Jakarasi and Ngoni Mugore. 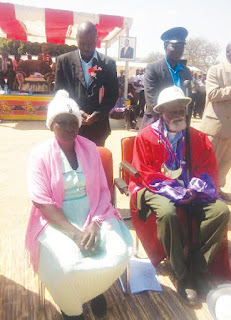 BUHERA –A new Chief Chimombe has been installed in Buhera. 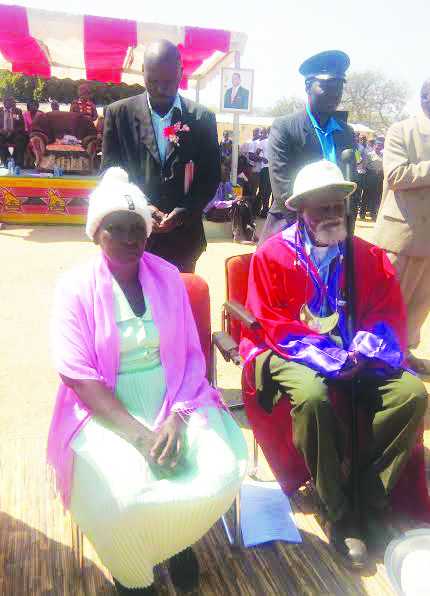 The Minister of State for Manicaland Province, Dr Ellen Gwaradzimba installed Muganhi Chifamba (86) on Wednesday last week and this is six years after his predecessor George Manyowa died. The installation took place at St John’s Primary School. Senator Chief Makumbe, Chief Nerutanga, Chief Mapungwana, Chief Chiduku, Chief Chitauro and Provincial Administrator Edgar Seenza attended the event. Chifamba becomes the ninth substantive chief of the Chimombe chieftainship. The Chimombes are of the Moyo and there are 36 village heads under this chieftainship. Causemore Manyowa has been the acting chief after the death of his father. Dr Gwaradzimba congratulated the new Chief Chimombe and encouraged him to work hard in order to develop his area. She urged him to work with Government to enforce development policies. Chikave was the founder of the Chimombe Chieftainship in ….. He was the last king of the Rozvi dynasty in Bikita and he came to Buhera as Chief Chimombe. In 1951 white settlers downgraded the Chimombe Chieftainship to headman-ship because they resisted the introduction of the Land Husbandry Act. They were placed under Chief Nyashanu. They refused to acknowledge the overall rule of the Nyashanu Chieftainship. Chikave had 10 sons namely, Mudavanhu, Karimba, Chandafira, Murakasha, Chifamba, Jakarasi, Munyanyi, Tabvemhiri, Charidza and Mugede. Tabvemhiri was then installed as headman Chimombe. The Chimombe clan continued to lobby Government for the restoration of their chieftainship and in 1967 the then Government reinstated it. In 1968, Mujee was installed and assumed the title Chief Chimombe. In 1983, Nhau Manyowa took over after the death of Mujee, George Manyowa came in in 1999. His son took over in an actong capacity from 2011 until now..
Chief Chimombe is married to Abigail Chizhande and they are blessed with 14 children. He went to St Bernard School and completed his standard 4. After that he went to work at Dorowa mine in 1959 as an engine feeder until 1966. From there he worked at Mulena supermarket from 1966 to 1968. He is a trained builder and farmer.